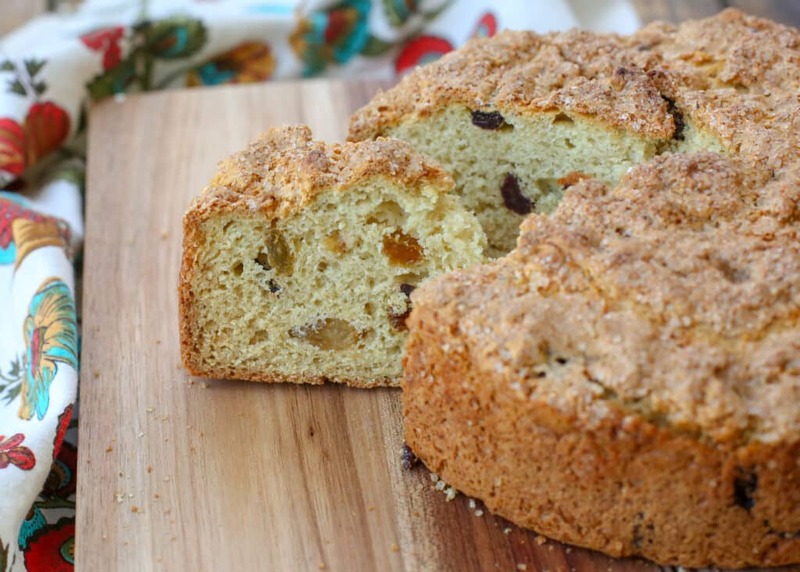 Irish Soda Bread with Raisins is a simple lightly sweetened quick bread filled with raisins and finished with a generous sprinkling of raw sugar. You can stir a loaf of this bread together in the time it takes to brew a pot of coffee. Our day in Belfast, Ireland was about as perfect as it could be. After spending the morning exploring Belfast, we headed out to the Irish countryside in County Down where we participated in a hands-on day of Irish bread making with Tracey Jeffries and Northern Ireland Food Tours. I couldn’t resist the opportunity to bake authentic Irish bread in the home of an Irish family. We were a small group of about 10 people and we had a wonderful day. This was part of a specialty food excursion with Princess Cruises and I can’t recommend it highly enough. We were greeted at Tracey’s home with a beautiful Irish tea complete with several varieties of bread fresh out of the oven. After we finished our tea, we made our own Irish soda bread and potato bread. 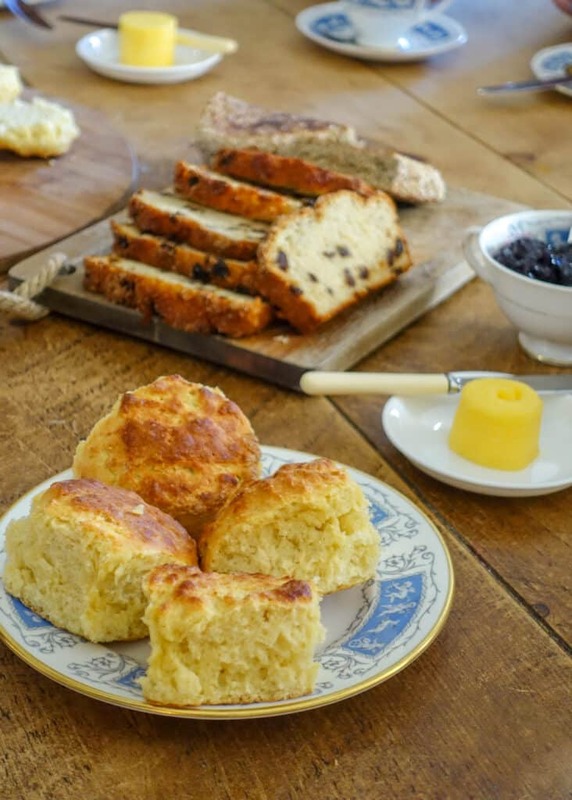 Do you know how easy it is to make Irish Soda Bread? It’s literally just flour, baking soda, a pinch of salt, and buttermilk added just until the texture is perfect. Irish Potato Bread simply adds leftover mashed potatoes to the equation. These are classic Irish bread recipes that have been staples in many homes for hundreds of years. I enjoyed making (and sampling!) 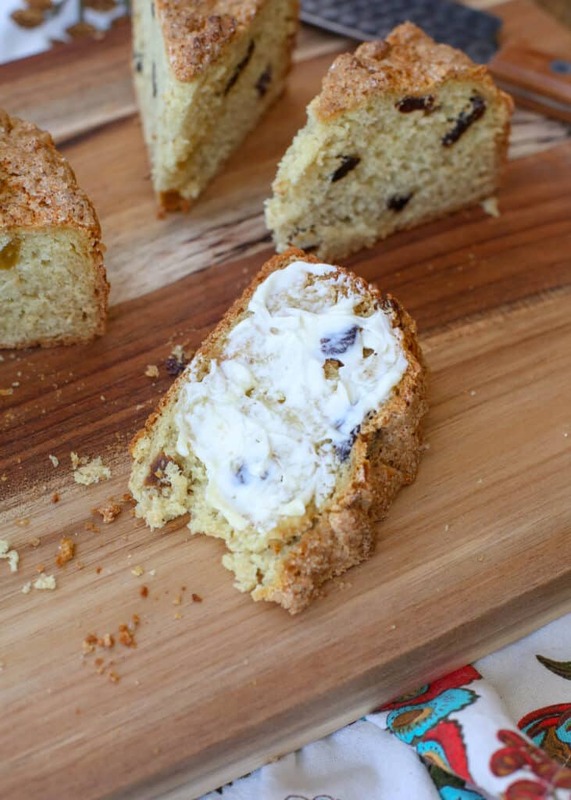 both recipes and we all had a lot of fun learning more about these soda breads. 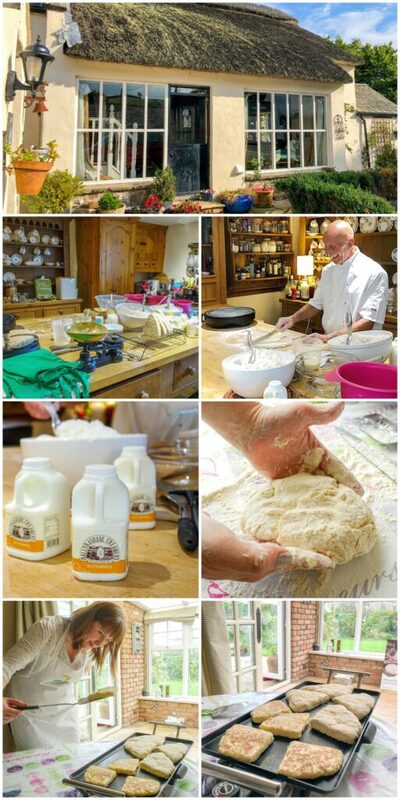 The opportunity to spend time visiting and baking bread in an Irish home was priceless and I love that this recipe transports me back to Ireland. Irish Raisin Soda Bread comes together in under ten minutes (honestly, it’s probably closer to five minutes) and then you just have to wait while it bakes in the oven. Soda bread is typically not a sweet bread at all. However, the raisins sweeten this bread nicely and there’s a little bit of sugar in the dough as well. Also, here’s a tip that I copied as well, Tracey sprinkled her bread with a little bit of raw sugar before popping it in the oven, making it a little bit sweeter with a lovely crunch on the crust. 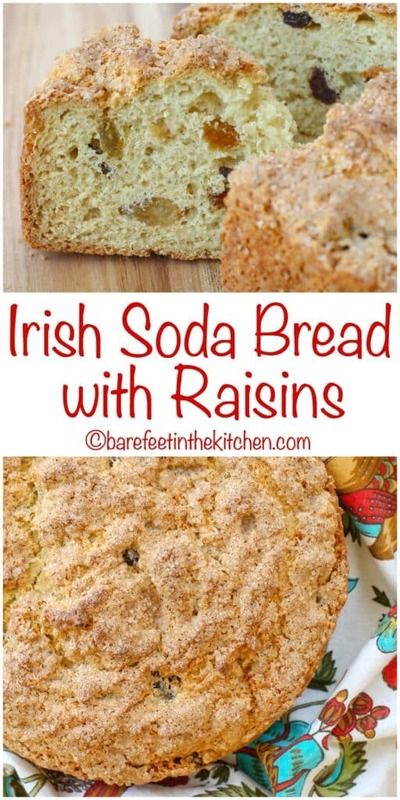 Today, I’m sharing the recipe for this Irish Raisin Soda Bread – or Irish Fruit Bannock, as Tracey calls it. Me, I call it the easiest Raisin Bread you can possibly make. Bannock is a variety of flat quick bread or any large, round article baked or cooked from grain. A bannock is usually cut into sections before serving. Traditionally, bannock is a quick bread fried in oil. However, Tracey’s bannock recipe was adapted for the oven, making it more like the quick breads and muffins that I usually make. For this recipe, I used a round pan, but bannock can also be baked on a sheet pan or in loaf pans. Just watch as it bakes and adjust the cooking time as needed. 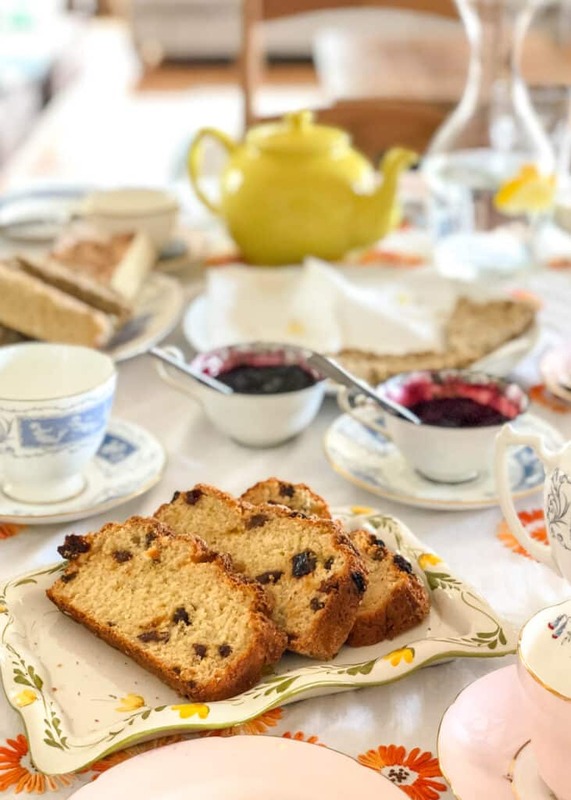 Have I convinced you yet just how much we enjoyed spending a day in an Irish cottage, baking bread and having tea and coffee? 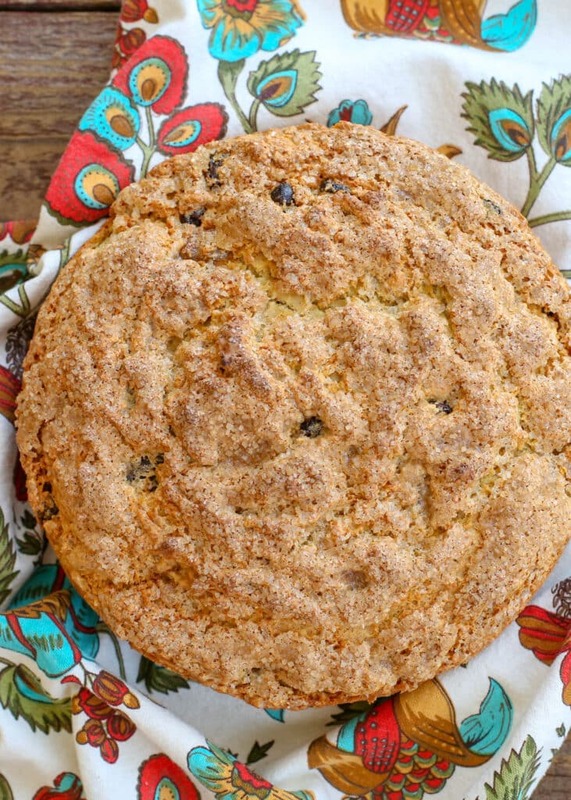 My favorite bite during our tea that afternoon was this Irish Soda Bread with Raisins and I am so happy that Tracey shared the recipe with me. This raisin bread was the first thing I made when we returned home. My boys loved this bread and it transported me back to Ireland with the first bite. Preheat the oven to 400°F and thoroughly grease an 8-inch round pan with butter. Set the pan aside. 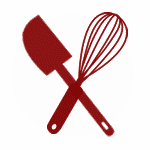 Whisk together the flour, baking soda, salt, and white sugar in a large mixing bowl. Make a well in the center of the dry ingredients. Set aside 1/4 cup of buttermilk and pour the remaining buttermilk into the well in the dry ingredients. Mix lightly with a wooden spoon to form a loose dough, adding the rest of the buttermilk ONLY if the batter is dry and crumbly. Stir in the raisins. Scoop the batter into the prepared cake pan and smooth the top. Sprinkle raw sugar generous over the top. Bake at 400°F for 30 minutes and then reduce the heat to 300°F for an additional 25 minutes, until the bread is golden brown and crisp to the touch. A toothpick inserted into the center should come out clean. Remove from the oven and cool completely on a wire rack. Slice into 8-12 pieces and serve with butter. 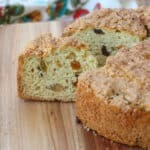 Irish Soda Bread with Raisins is lightly sweetened and perfect for breakfast or an afternoon tea. Preheat the oven to 400°F and thoroughly grease an 8-inch round pan with butter. Set the pan aside. Whisk together the flour, baking soda, salt, and white sugar in a large mixing bowl. Mix lightly with a wooden spoon to form a loose dough, adding the rest of the buttermilk ONLY if necessary. Stir in the raisins. Scoop the batter into the prepared cake pan and smooth the top. Sprinkle raw sugar generously over the top. Any dried fruits will work for this recipe, however, an assortment of different varieties is fun to use. I buy a multi-variety package of raisins at Trader Joe's. It includes sultanas, or golden raisins, jumbo raisins, and the more traditional California raisins. To read more about our cruise through the British Isles, check out A Day at Dunrobin Castle, That Time I Turned 40. Twice. My 40ish Birthday, DIY Cheese Plates, and A Day in Belfast, Ireland. This says add cinnamon in directions, how much cinnamon????? oops! That was a mistake. I actually tested the recipe both ways and found that the cinnamon didn't make much of a difference in the end result and I liked it without best. :) I've corrected it now. Enjoy! Wher canI get Raw sugar? You should be able to buy raw sugar in the baking aisle of any grocery store. Happy baking! Thanks so much. I made this today and OMG can’t stop eating this. It is sooooooo good. GLUTEN FREE IRISH SODA BREAD, also delicious. Normally you have your notes about how to sub out the flour to make it GF. I'm letting you know, I used the barefeetithekitchen GF ALL PURPOSE FLOUR MIX[ 1tsp xanthan , 1 and 1/2c rice FL, 2/3c Potato Starch, 1/3c. Tapioca Starch, 1/2 t salt, 1 T Baking Powder, 1/2 t. Baking Soda ]Then I followed this recipe above *also adding in* the listed baking soda, salt etc (*Soda bread means more baking soda) Also I used currants. It was delicious! I also want to try it with dried blueberries next time. It was a hit. That's awesome it worked so well for you with that variation! Thanks for taking the time to share it with us.